When this youtube video showed up, it seemed kind of unbelievable that someone who works underwater would be dumb enough to stick their hand in a fish’s mouth, but this guy did. 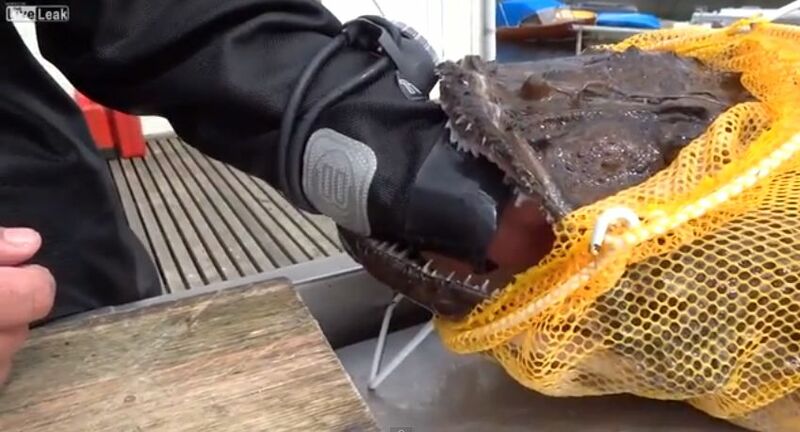 Unfortunately for him, it was a monkfish–an ugly beast that sits on the bottom and appears to be all mouth. When it bites down with its powerful jaw and inward facing teeth, it’s like a bear trap. This guy has a hard time getting the fish off. It’s entertaining to think he got what he deserved, but it’s pretty disgusting to see how obnoxious they were to the poor fish once they freed the diver from it’s grip.